They once stood grand green and lush within their nurtured station, waggishly waving along with the oft warm breezes of summer as an unnoticing city occasionally strolled by. 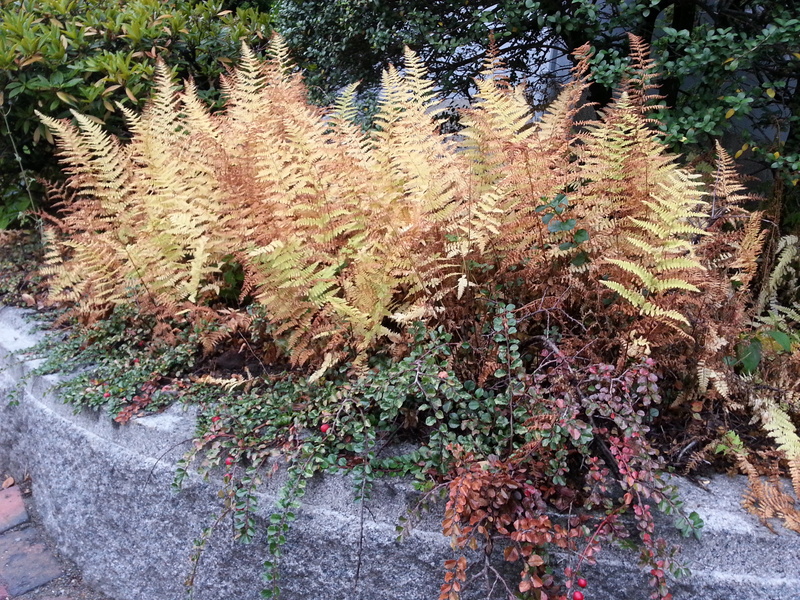 It was now approaching sleepy season, so the caboodle of drowsy ferns with yellowing appetites huddled together preparing for the inevitable interlude which cued that same old winter song. I like this one – it has me thinking – The dance is slowing down to a creeping crawl…then off to sleep through the winter’s haul…but…in due time it will come, the dance will pick up…and these coquettish ferns will be swinging under a be-dazzling sun! You are delightfully too kind. Thank You. 🙂 I truly love your creative comment. Very beautifully written. Beautiful again ! That same old winter song. Man, nothing stops the rolling of the seasons! Thank You so very much mate! I honestly appreciate it. I smelled this one. This is just fantastic imagery and the picture isn’t half bad either. Thank You so much for your wonderful words. I truly appreciate it. Love the concept of your site, you use your voice to paint such a unique perception of the ordinary things around you. Thank god there are writers like you who can truly find a story in every day! You are far too kind. Thank You so very much. Yet, they still have a prettiness of their own. Simply standing there in their station being unnoticed, although I noticed and I agree with you. Thank You. That is super kind of you to say Suzanne. Thank You very much. Your kindness is lovely. Thank You. I am thoroughly flattered. Thank You so very much. I truly appreciate your kind words. You’re more then welcome :). Hey, this was good for me to read this morning. And this piece, “drowsy ferns with yellowing appetites huddled together”, was nice. I think your photos are beautiful. You have an eye for capturing the season literally and figuratively. You’re the first follower that I’ll be keeping an eye on. Perhaps we see the occasional something in the same light. Thank You so very much Lynn. I honestly appreciate that. The fraying color is beautiful, yellowing appetites and sleepy season add more depth to your two sentences. Thank You so much. I always appreciate your wonderful comments. I really appreciate that Kurt. Thank You.